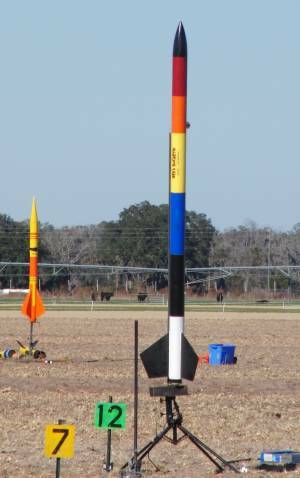 The YouBee is an (approximately 6:1) upscale of the Odd'l Rockets Break Away model rocket. 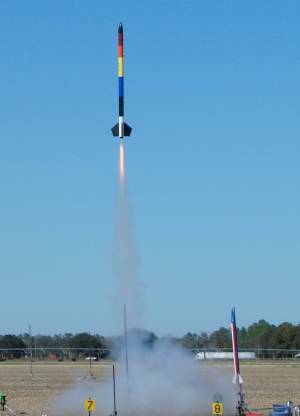 At apogee, the YouBee "breaks" into several sections connected by a long shock cord - like the model rocket does. But, because of its size and weight, the YouBee also has a parachute which is deployed by an altimeter when the rocket falls to about 900' in altitude. 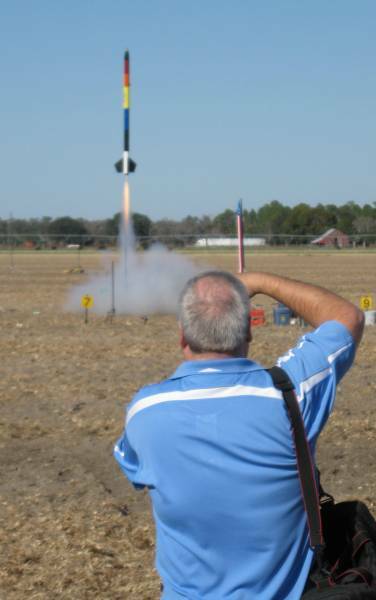 Cool and clear, with the sky a deep shade of blue, Saturday looked like a terrific day for flying rockets. But, we quickly noticed a problem - a brisk wind which blew from the west. 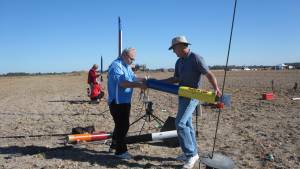 The wind made assembling the ejection charges, a challenge. I should have prepared them earlier, but I just did not have time. 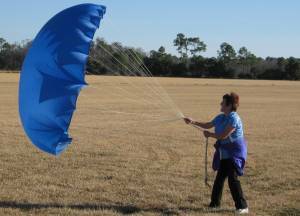 The wind did, however, make it easier to inflate the parachute so Bracha could untangle the shroud lines. Assembling the rocket and erecting it on the launch pad presented a few challenges, but, with the help of Chris and John, it went smoother than I had anticipated. On top of the Quad-Pod, the YouBee towered over us. Standing on a ladder, I barely reached the switch for the altimeter and had to activate the on-board camera one-handed. 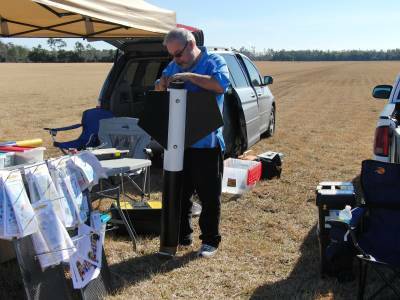 I did not start to feel nervous until Bracha and I reached the LCO table and turned around to see the YouBee standing on the launch pad. 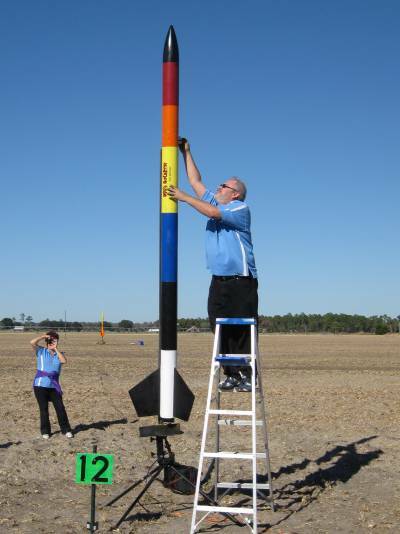 It seemed that it took forever before the LCO started counting down for the launch of the YouBee. I pre-focused my camera and pointed it in the general direction of the YouBee. I wanted to watch the lift-off with my own eyes, not through the camera's small view finder. The AMW Pro-X K455 motor instantly roared to life and the YouBee shot from the pad. The deep blue sky provided a brilliant backdrop as the rocket arced to the west leaving a trail of white smoke. I held my breath as the rocket reached apogee and seemed to turn downward. The sections separated and small drogue 'chute appeared. The rocket fell horizontally, just as designed, and drifted to the east. It continued past us and over the other field to the right of us. Just before reaching a group of trees, the main parachute deployed. The rocket's sections formed a long trail hanging below the fully-inflated parachute. The rocket sank out of sight behind the trees. I thought the rocket had cleared the trees until I saw the parachute collapse while still above the tree line. 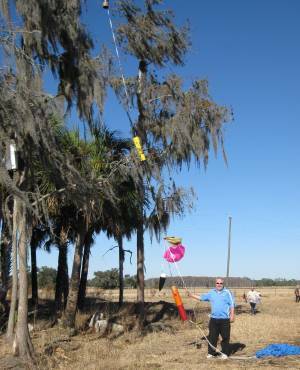 Chris and John met me in the far field where we found the rocket draped over a tree with the fin section in the air and the nose on the ground. 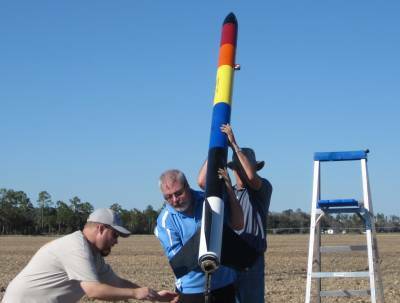 It took a spirited game of tug-of-war with the shock cord to wrestled the rocket to the ground. The fin section had a small hole it in where a tree limb had apparently punctured it. The fin section also had a zipper through the coupler and into the body tube. The damage will be easy to repair. We gathered up the rocket and carried it back. The altimeter continued to beep out "1 - 6 - 7 - 1" - 1671 feet - not quite as high as I had expected based on Rocksim projections. When we arrived back at the launch site and I had time to look more closely at the rocket, I discovered one other problem. The bottom of the main parachute's shroud lines were completely severed. The ejection charge had melted them. The parachute was no longer attached to the rocket. The shroud lines had tangled with the shock cord which was all that had kept the rocket from falling away from the parachute. Next time, I'll ensure that the parachute and its shroud lines are better protected. I'm actually pleased that the K455 motor did not propel the rocket as high as predicted. 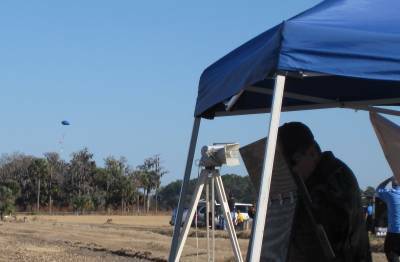 The size of NEFAR's field is better for flights to 1600 or 1700 feet (especially when it is windy) than for flights to higher altitudes. 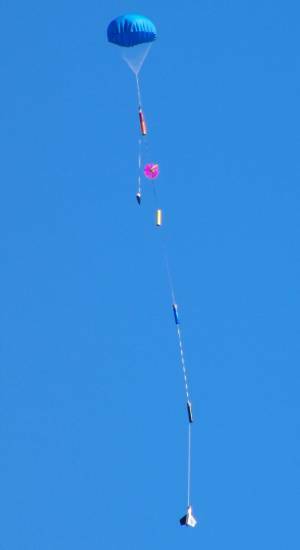 Now that I know that the "Wacky Wiggler" recovery works, I'll set the main to deploy at a lower altitude. That will help it drift less ... and give us more time to watch it wiggle! A discussion of the building, and first flight, of the YouBee, can be found in The Rocketry Forum. PostScript: After the flight I discovered something interesting when I removed the motor. The motor casing had a hole in it! It's not the result of a burn-through since the hole is punched into the tube. 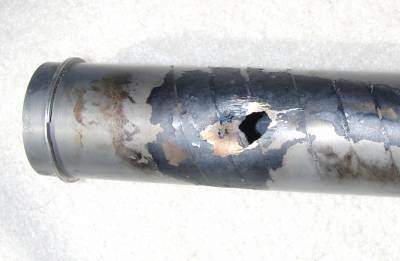 Apparently, the tree limb that penetrated the bottom of the rocket went all the way into the motor. The spiral grooves on the motor were created when I twisted it to remove it from the motor mount. Great project. Too bad about the damaged motor casing. I hope you were able to get a replacement for it. I have the regular sized Break-Away kit and enjoy launching it. I think somebody SHOT your rocket! Durn neighbor kids! Get off my lawn!